All of those new crypto-focused hedge funds hoping to extract profits from volatile cryptocurrencies are about to be very disappointed. 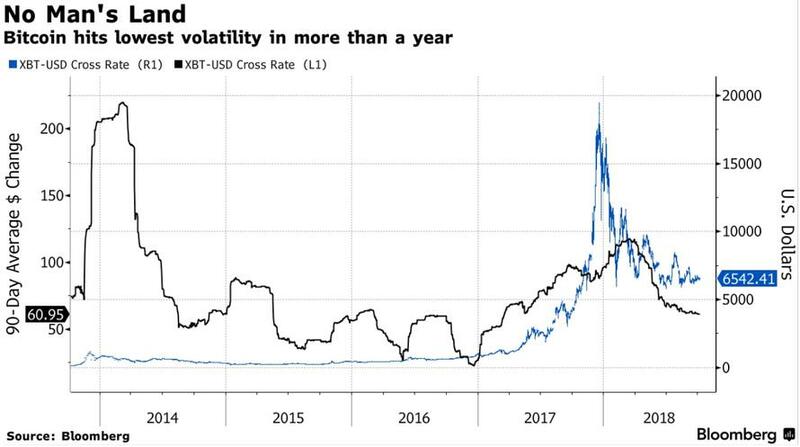 In what some hope will be a sign of maturity (and a harbinger of positive returns) for the struggling market, volatility in the world's oldest cryptocurrency has fallen to their lowest levels in 17 months, since before last year's spectacular bubble. Meanwhile, trading volume has also tapered off, which has prompted Bloomberg to question: Are we at an inflection point in the market, and if we are, is this the start of a new phase for Bitcoin? Or is it the beginning of the end? Lower volume might disappoint exchanges that handle trading in bitcoin futures. But technicals suggest the price could be on the verge of a breakout. As Bloomberg explains, neither a strong positive or negative divergence has occurred over the past month. The last time bitcoin traded in this pattern back in June, its price jumped from around $5,900 to around $8,200. Bitcoin's rapid boom-and-bust has disabused thousands of investors of the notion that the cryptocurrency is a worthwhile investment with enduring intrinsic value. That said, there are still some who remain optimistic about the cryptocurrency's long-term prospects. 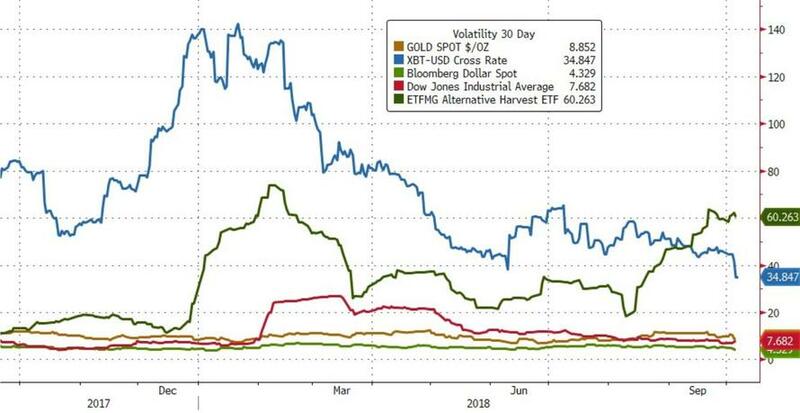 And they're inclined to see this drop in volatility as a sign that bitcoin is finally "maturing." One crypto trader argued that lower trading volumes meant more investors were holding on for the long term. While speculators are being driven out of the market. Naeem Aslam, chief market analyst at TF Global Markets U.K., struck a more sober tone. If volatility and volume both remain low, he said, it means "capitulation." 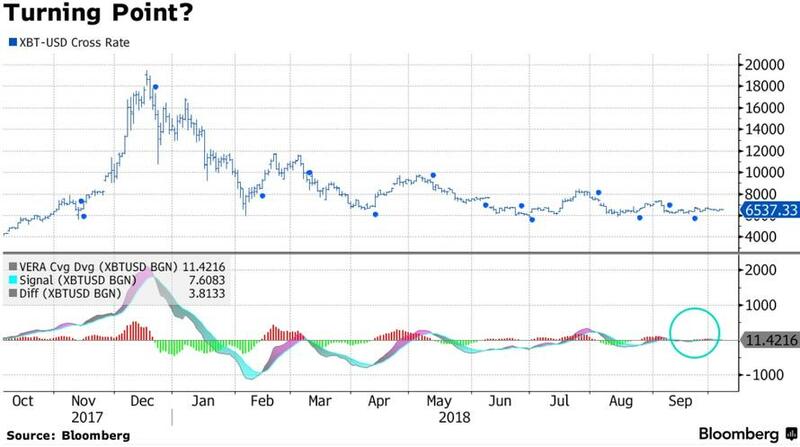 ...With one investor telling Bloomberg that bitcoin "isn't exciting anymore", something that might trigger flashbacks to the bear market from 2014 and 2015. But for Stephen Innes, head of Asia Pacific trading at Oanda Corp., it suggests investors may be losing interest in cryptocurrencies after a more than $600 billion selloff since the start of 2018. While the slump has been interspersed with several market rallies, they’ve gotten smaller and smaller as the year has progressed. "It’s not that exciting anymore," Innes said. Either way, one thing is clear: bitcoin has ceded its status as the faddish investment du jour to the marijuana stocks, which are experiencing a volatility explosion.